There is a story behind every autograph. Idly fossicking about on Google I have retrieved a few such stories and added some of my own. It needs cojones to be an autograph hound so I offer much respect to those who have hunted down celebs and obtained signatures. The best collection I ever bought (about 2000+ inc Walt Disney, Ian Fleming, Bogart and Bacall, the Dalai Lama, Frankie Lyman (and the Teenagers) Tony Hancock and Lester Piggot) was from a very minor celebrity who was able to get into receptions and first nights etc., He had written jokes for Bob Monkhouse. It doesn't get much better. The greatest groupies and name droppers are often slightly famous themselves and a minor name will often have accumulated a few major names. Rudyard Kipling received a note from a fan saying '...I hear you get paid $5 for every word you write. Enclosed is $5, please send me one word. Kipling replied with the one word "Thanks." George Bernard Shaw was more generous (and even wittier). To fans writing to ask for his autograph he would often reply "Certainly not! George Bernard Shaw." The painter Utrillo could, after a few free drinks, be induced to sign canvasses that he had not painted. Buyers beware. Damien Hirst, the foolishly successful artist, sometimes signs things (books, tea shirts) as David Hockney. These are still saleable as he is known to do this and, in its way, it is also quite witty. 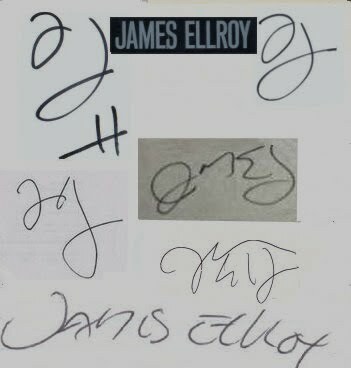 American crime writer and essayist James Ellroy signed every one of 65,000 first-edition copies of his 1996 memoir My Dark Places. You can buy a fine signed copy on ABE for $5 - there are over 200 signed copies for sale there with several over $100. As the signing progressed his signature degenerated to an unreadable scrawl. The ever-optimistic Booksniffer of Sussex manages to make a virtue of this '…wildly scrawled signature, as frantic and vigorous as the author's crackling prose.' $70 with free postage in UK. 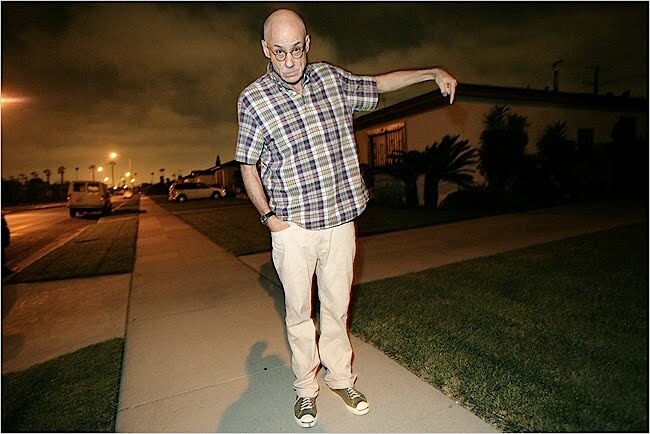 The above pic is of the great man pointing to the exact spot in L.A. where the murder victim known as the Black Dahlia was found. Lou Reed's signature is the worst I have seen. It goes like this '----- -----.' Two almost straight slashed lines, making Ellroy's signature look like the handwriting of a village postmistress. Possibly easy to forge, so provenance needed when buying. I once met Alfred Bester at a science fiction convention only minutes after having bought one of his books in the dealers' room. Naturally, I asked him to sign it, but it turned out to be already signed. Without a moment's hesitation, he wrote "That man is an impostor! Alfie B." under the original signature ("Alfred Bester"). Its too bad Ellroy's signature has degenerated into slasher territory. I suppose 65000 copies will do that to you. I have a great signed first of his White Jazz (1992). The book featured an epic jacket photo of a police car's door shot full of bullet holes. It's signed fairly legibly, with the bracing motto: "Blood Reign!! -James Ellroy"
I count myself amongst the many, many purchasers of the Ellroy first edition. The scrawl it contains looks a bit like a marriage of the two that appear above the bottom signature. Interesting to learn about Lou Reed's signature, which appears to have something in common with that of Michael Ondaatje. I predict that the novelist's signature - once quite legible - will one day feature nothing more than two straight lines. I have a UK first of The Cold Six Thousand which Ellroy signed for me a a launch and added a nice wee drawing of his dog Dudley (not sure if he's named after Dudley the bad detective in LA Con or the other way round). I took a copy of Ian Rankin's first book The Flood to one of his Rebus signings. I was mortified when Rankin began speaking by saying how he had given away most copies of The Flood and wished he had them back - but he was completely charming about signing my copy. Never turn down a signed copy. Mentioned this before but worth repeating - a Scottish journalist interviewed a first-time author and turned down her offer of a signed copy of her book which was a story about a child wizard. . . Thanks Edwin-- that was probably £20K down the drain for the diffident Scot. Also you could have sold your Flood to Rankin, he must have bags of money, after all it was signed! Brian-- I guess in theory you could have Lou's copy of an Ondaatje book also signed by Ondaatje and it would merely have 4 straight lines. A puzzler. My favourite autograph story was told to me by a 'retired' autograph hunter who once had a friend who collected tyrants' autographs! The friend was keen to have Colonel Gaddafi's autograph and wrote, from the US, saying that he was about to name his new baby boy after the Colonel and would it be possible to have a signed photo as it would mean a lot in years to come... The Colonel sent the photo... and an engraved gold watch with a note about the photographer he was also sending who would be able to take photos of the child, parents and gifts. A child had to be found at short notice and a faux photo session was endured but, in the end, I suppose the autograph was successfully added to his collection. You need to be careful when asking authors to inscribe books which have become valuable. A friend, at a dinner party where Robert Lowell was also present, asked Lowell to inscribe a copy of Land of Unlikeness, his first book. Lowell scrawled "This book is worth a lot of money" across the title page. Thanks for these amazing stories. A good ruse there Chaz but you have to look like an Elmore! Hard to top Callum's story of the collector of tyrant autographs...the gold watch was a bonus! The Damien Hirst photo is of L.A.? I would have bet on it being Florida -and been wrong, obviously. Street architecture must be the same on the other coast. Think I missed the Hotel California palm trees in the background. I must get out more often.